Easter began his career with Wolverhampton Wanderers before moving on to Hartlepool United in 2001, and then to Spennymoor United, Cambridge United, Boston United, Stockport County and Wycombe Wanderers over the following six years. A Welsh international striker, he joined Argyle from Wycombe in October 2007, initially on loan, and then permanently when the transfer window opened. 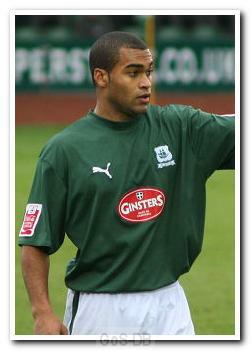 After scoring just six goals in his first season at Argyle he expressed a wish to leave Home Park for personal reasons. No transfer offers were received but he joined Millwall on loan, which was subsequently cancelled to allow him to join Colchester United in another temporary move. After a successful spell at Colchester, he was forced to return to Argyle in December 2008 after suffering a medial ligament injury. After recovering he left Home Park the following summer and joined League One MK Dons. In a two-year spell at Stadium:MK, Easter scored 15 goals in 50 games, and was also loaned to then Championship side Swansea City in November 2010. Despite wanting to make his move to South Wales permanent, he was recalled by MK Dons and within 24 hours had joined rival Championship side Crystal Palace for an undisclosed fee, signing a two-and-a-half year deal. In his time at Selhurst Park he played 55 times and scored 8 goals before joining Millwall on loan in March 2013. In July 2013 the move to The New Den was made permanent when he signed a one-year deal with Millwall, joining other former Pilgrims: Shane Lowry, Paul Connolly, Lee Martin and Nadijm Abdou. In January 2015 Easter's contract at Millwall was cancelled by mutual consent, one of a number to suffer a clear-out by manager Ian Holloway. In his 18 months at The New Den, Easter had played 44 times and scored 5 goals. However, he was quickly snapped up by Bristol Rovers, then in the Football Conference. With his help, Rovers were promoted to League Two at the end of the 2015-16 campaign and then went straight up to League One the following season. Easter was told that he was free to leave the club in January 2017 but he continued to feature intermittently in the first team squad and even managed a goal on his final appearance. After a total of 14 goals in 76 appearances, the 35-year-old was one of eight players released by Rovers at the end of the 2016-17 season. Easter then had a pre-season trial at Yeovil Town and was offered a professional contract. However, the move never happened and in August 2017 he revealed on social media that he had retired from playing to concentrate on a job outside of football.